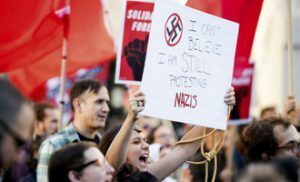 For more information on the First Amendment right to protest, see our Protest Primer and podcast episodes about the Charlottesville rallies and proposed state laws aimed at chilling the freedom to protest. This entry was posted in First Amendment News, News and tagged censorship, civil rights, fighting words, First Amendment, free speech, hate speech, protest by Gene Policinski. Bookmark the permalink.